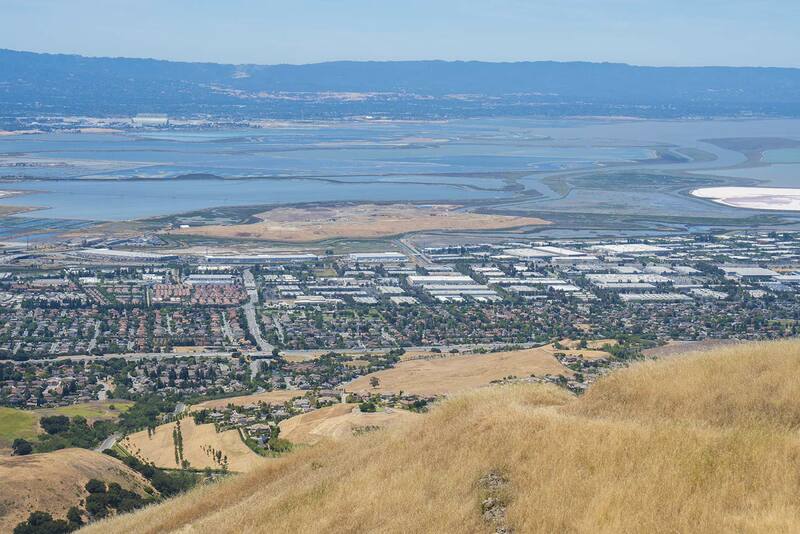 From most places in Silicon Valley three high, grass-covered peaks are a prominent part of the eastern skyline. 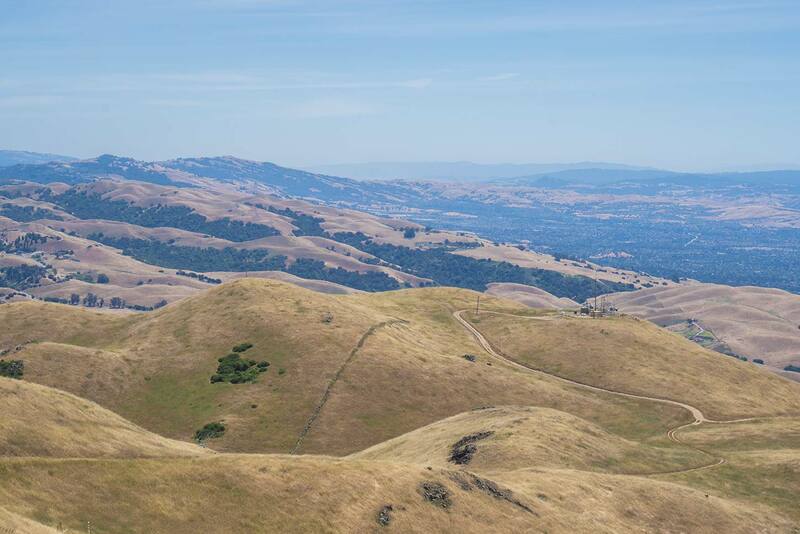 The southernmost of these, adorned with a single radio antenna, is Monument Peak, while the northernmost is the much better-known Mission Peak. 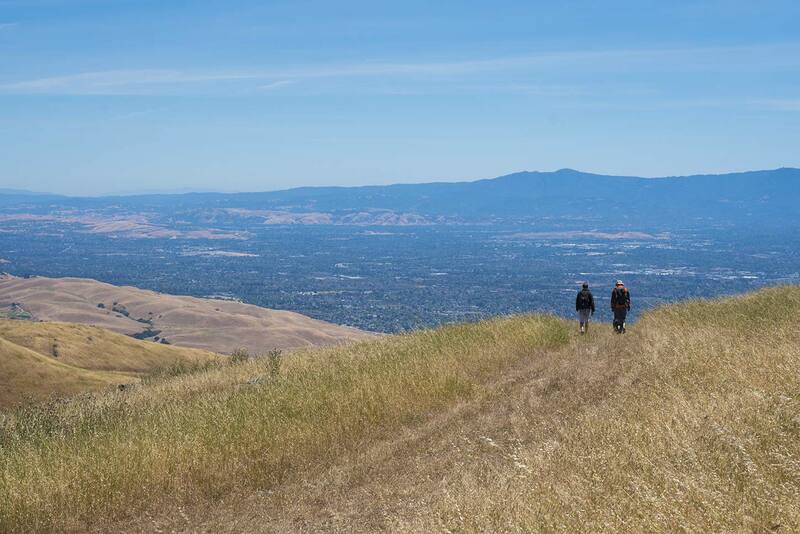 Monument Peak, therefore, has the same great views as Mission Peak but without the crowds. The Monument Peak hike is more difficult since it’s quite a bit longer and the trail isn’t as well-graded. Rather incongruously for a hike that features abundent views of the entire urbanized South Bay, it has a rather quiet, backcountry feel. And the views are spectacular. The park charges a $6 entrance fee. 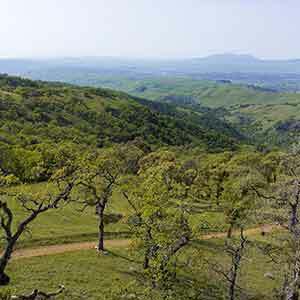 The hike is almost entirely on exposed, west-facing hillsides that turn into a furnace on summer afternoons. Don’t do this hike if the forecast high for the day is above 85º, since on the slopes the temperature will be much higher. Start from one of the parking lots at the end of Downing Road. Make your way to the Tularcitos Trailhead, next to the dog park. The trail begins as a dirt road that climbs steeply out of the park’s central basin. The trail soon levels out, though, making for a nice pleasant start to the hike. The trail passes a a paraglider and hang glider launch site, after which there’s a brief climb. The real climbing, though, doesn’t start until after the trail crosses Monument Peak Road. 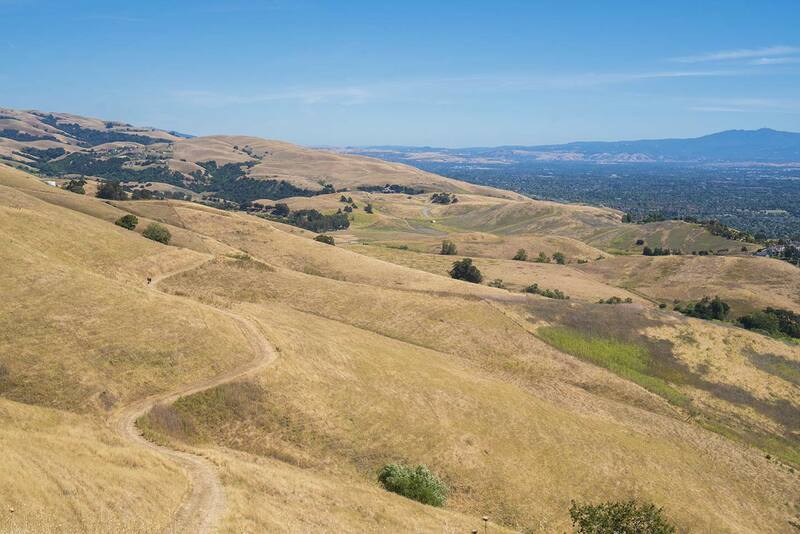 The trail climbs through a little copse of trees, then breaks out onto an open, grassy hillside with increasingly impressive views of the South Bay. The winding singletrack trail makes the hike much more interesting than a dirt road. 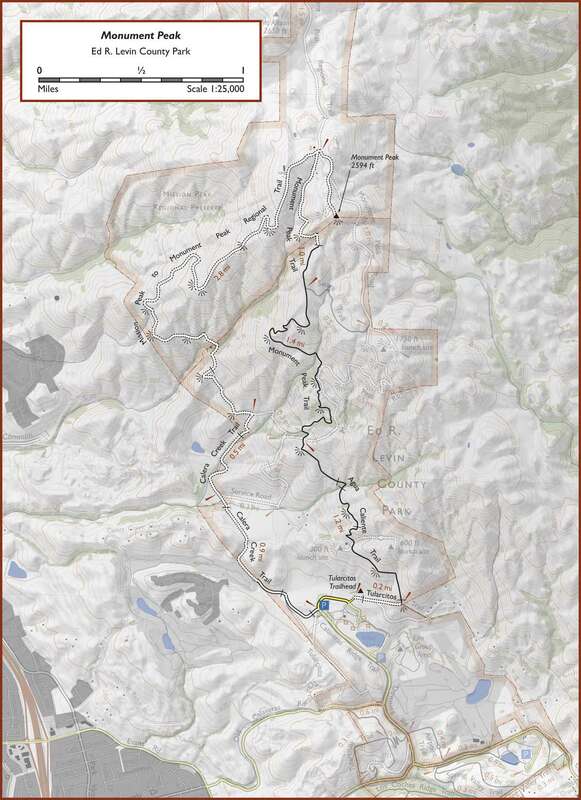 The steepest part of the climb is over by the time the trail reaches an intersection with the Sierra Trail. The Sierra Trail is little-used and so overgrown that it’s almost invisible, which is unfortunate because it would be a much more scenic way to get to the peak. As it is, though, it’s a lot easier to just continue on the Monument Peak Trail. The trail turns into a fold, where it passes the huge antenna. Just afterward, it reaches a saddle with a four-way intersection. Turn right onto the gravel Monument Peak Road, then after a short descent, turn right onto the dead-end dirt road that leads to Monument Peak. During this side trip to the peak, views of the undeveloped hills to the east open up for the first time. 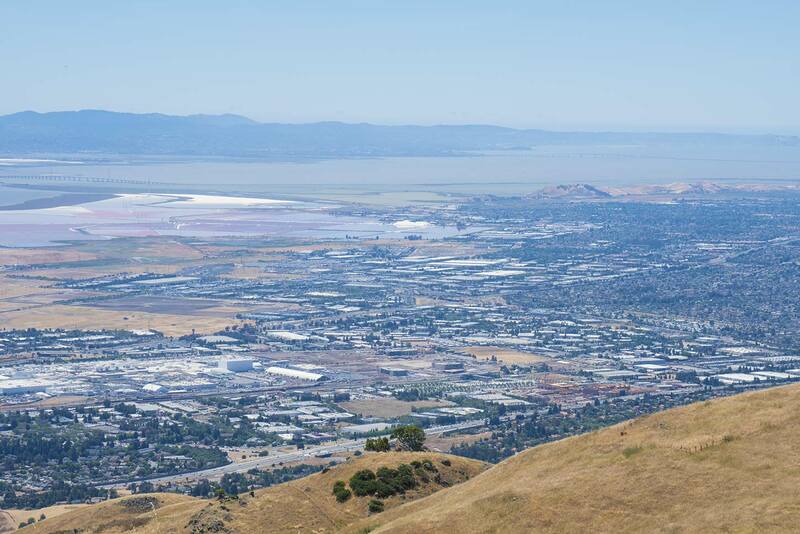 It’s remarkable how quiet the ridgetop road is, even though almost the entire Bay Area is clearly visible below. The peak itself is a bit of a letdown. There’s a tiny rock formation, a service building for the antennas, and an empty cement antenna pad. At least the peak itself isn’t occupied by an antenna farm, as it is at nearby Mount Allison. There are some nice views, especially to the south, but the views aren’t really much better than the views from the surrounding trails.Most people, in fact, skip the side trip to the peak. Return on the Mission Peak to Monument Peak Regional Trail. This trail gets off to a great start, with some of the most spectacular views of the hike. However, it soon begins a steep descent into an area that’s often heavily grazed, giving it an ugly grey, barren look. This lasts until the trail crosses back into Ed Levin County Park, where there’s an abrupt change to a more healthy-looking landscape. The overly-long and steep return leg is the only real issue with what’s otherwise a stellar hike, but it’s still better than just hiking out-and-back on the Monument Peak Trail. The road briefly passes through a tree-lined gully that doesn’t seem that significant but is a promenent feature of the peak as seen from below. A little while later there’s a final steep descent through a row of streamside trees, then the trail levels out, leaving the views behind. 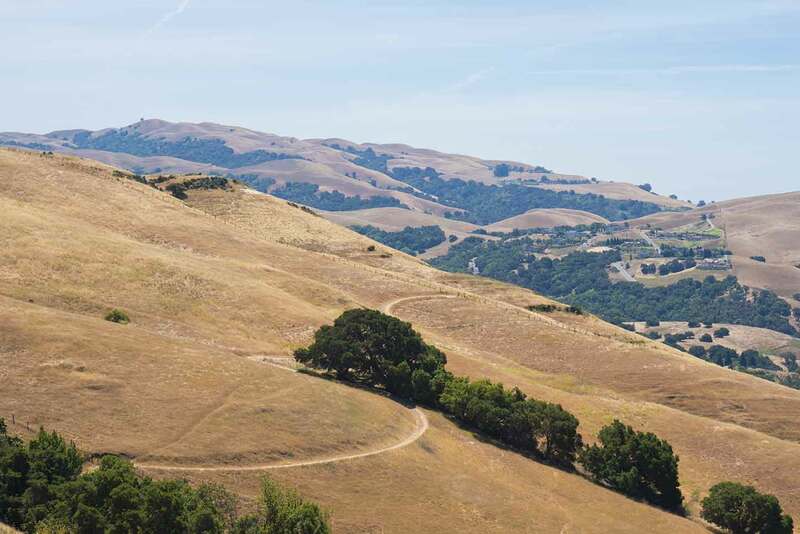 There are a few miles of somewhat dull walking as the trail runs through the park’s central basin, passing a golf course, a fenced-off cow pasture, and the paraglider landing area. Stay to the right in this area; the official map doesn’t really make this clear, but the service road to the left leads to private residences where the road is closed to the public.